Did you know that chronic stress undermines your behavior in relationships? Applied neuroscience research shows that when your brain and nervous system are dominated by the stress response you are prone to greater anxiety, irritability, negative mood and behavioral rigidity. This is because when stressed, you lose access to higher cognitive functions like paying attention, listening, planning, reasoning, and the capacity to communicate effectively. Did you also know that you have the capacity to reduce stress in an instant? It’s true. You can change your experience by changing your breath. Here’s why. The autonomic nervous system (ANS), a key player in the fight, flight or freeze response, has long been proposed to influence social behavior. Its function is to respond to environmental demands by either catalyzing the mind-body system in response to threat, or maintaining homeostatic balance during which rest, repair and growth are possible. The ANS is divided into two major branches: the sympathetic nervous system (SNS) and the parasympathetic nervous system (PNS). The SNS is often equated to a physiological “gas pedal.” When an organism perceives threat, the SNS dumps a cascade of stress hormones into the blood stream that increase heart rate, blood pressure and respiration, contract muscle, and depress all non-essential functions like digestion. In this state, the brain’s fear circuitry, which resides in the limbic system, is also dominant, drawing important resources away from the prefrontal cortex and other regions of the brain where planning, reasoning and effective communication occur. When the SNS is dominant, social behavior becomes limited to survival strategies such as aggression, avoidance or withdrawal. The counterbalance to the SNS, the PNS, is often thought of as a physiological “brake pedal.” Under conditions of safety, the PNS initiates a relaxation response, which depresses heart rate, blood pressure and respiration, reduces muscle tone/contraction, and allows the organism to engage in reparative and restorative functions such as digestion. In this state, the brain’s fear circuitry is no longer mobilized, freeing up higher order cognitive functioning and enabling a wider and more flexible range of behavior. Although the SNS and PNS contribute significantly to our behavioral repertoire, Polyvagal Theory suggests that, for mammals and humans, the link between ANS functioning and behavior is far more complex. Led by behavioral neuroscientist Stephen Porges, contemporary neuroscientists and clinical psychologists are beginning to take note of the important influence of the Xth cranial nerve, also known as the vagus nerve, in the development and maintenance of adaptive and maladaptive social behavior. Charles Darwin first noted the vagus nerve and its role in social behavior in 1872. In his book, The Expression of Emotions in Man and Animals, Darwin proposed that the central nervous system and the vagus nerve engage in a dynamic, reciprocal exchange of neurologic information that influences the spontaneous expression of emotion. Darwin contended that human affective expression is integral to survival, adaptation and natural selection. Rather than being simply a reaction to experience, Darwin hypothesized that emotional expression is reciprocally linked to physiology, and that distinct neural pathways bi-directionally exchange information between brain structures and major visceral organs such as the heart, lungs and gut. “When the heart is affected it reacts on the brain,” wrote Darwin; “and the state of the brain again reacts through the pneumogastric (vagus) nerve on the heart; so that under any excitement there will be much mutual action and reaction between these, the two most important organs of the body” (Darwin, 1872, P69). This is perhaps one of the first Western scientific acknowledgements of the mind-body connection! The word, vagus, is Latin for wanderer. Indeed, the influence of the vagus nerve is diffuse. It originates in the medulla oblongata in the brain stem and projects to many visceral organs including the heart, lungs and digestive tract, independently of the spinal column. The vagal system represents a complex of nerve branches that relay signals from the brain to the body (afferent), and from visceral organs to the brain (efferent). This bi-directional influence allows for the efficient regulation of metabolic output in response to environmental demands. Activity of the vagus nerve is referred to as vagal tone and measured vis-à-vis respiratory sinus arrhythmia (RSA). RSA refers to the rhythmic increase and decrease in heart rate that occurs synchronously with breathing. During inhalation our heart rate increases (sympathetic nervous system influence) and vagal influence decreases. During exhalation, however, heart rate decreases as vagus influence increases (parasympathetic nervous system influence). RSA, as an indicator of vagal tone, is used examine the functional state of the parasympathetic nervous system. Specifically, the amplitude of RSA variability provides a measure of the influence of the vagus nerve on the heart. Higher levels of RSA variability indicate greater vagal tone during the breath cycle, which also reflects the body’s ability to respond to increasing metabolic demands and environmental challenges. The perception of real or imagined threat activates the SNS and depresses PNS, or vagal, influence. These coordinated physical reactions increase metabolic output in response to environmental demands. Once threat is removed, the vagus becomes dominant and vagal tone increases, initiating the visceral organs’ return to homeostasis during which recovery, growth and repair resume. Stress, then, is any real or imagined stimulus that disrupts homeostasis and leads to the withdrawal of PNS/vagal tone and the initiation of a rapid SNS response. In his influential book, The Polyvagal Theory: Neurophysiological Foundations of Emotion, Attachment, Communication and Self Regulation, Stephen Porges examined the phylogenic evolution of the human nervous system and the role of vagal tone in the development of social behavior. His polyvagal theory is predicated on the assumption that the human autonomic nervous system (ANS) is derived from 3 phylogenic stages of neurological development. The first stage, which we see in primitive life forms, is associated with immobilization behaviors such as freezing and feigning death in the presence of threat. The second stage includes SNS influence, which increases metabolic output and inhibits PNS/vagal tone to mobilize for fight or flight. The third stage, which is unique to mammals, includes the addition of myelinated vagal nerves that are capable of rapidly regulating cardiac output to facilitate both engagement and disengagement from environmental stimuli. This myelinated branch of the vagal system controls facial muscles associated with speaking, swallowing, sucking and, most importantly, breathing. It also regulates SNS pathways to the heart, and can rapidly initiate relaxation and calm. These regulatory systems of the vagus and associated cranial nerves are believed to provide the substrate for emotional experiences and social behavior. Polyvagal theory links the evolution of the autonomic nervous system to emotional experience and expression, vocal communication and social behavior. In his decades of research examining the ways in which the phylogenic development of the vagus has affected human behavioral expression, Porges found that the more recently evolved, myelinated branches of the vagus nerve found in mammals play a distinct role in attention, self-regulation, communication, emotional expression, resilience to stress and other capacities central to social functioning. These myelinated vagus fibers, which send signals to the brain much more quickly than the phylogenically older, unmyelinated fibers, inhibit these older systems. As a result the newer, myelinated vagal system in mammals can override the signals of the SNS, a phenomenon that Porges refers to as the vagal brake. The vagal brake’s essential function is to regulate heart rate through the rapid inhibition and disinhibition of vagal tone to the heart. When the brake is applied, vagal tone increases and cardiac output is reduced promoting relaxation, self-soothing, growth and repair. Conversely, when the brake is released, the SNS becomes dominant, and heart rate increases to catalyze the system in response to environmental demands. When this brake is impaired for any reason, phylogenically older autonomic responses are activated, resulting in a narrowed repertoire of fight or flight behaviors. 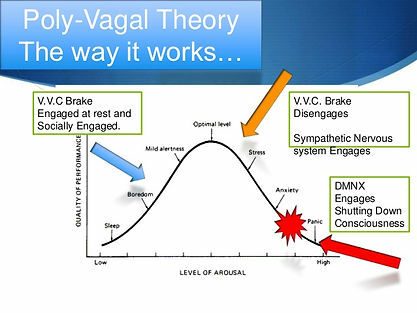 According to proponents of polyvagal theory, the vagal brake plays a pivotal role in the development of appropriate social behavior. Because of its capacity to rapidly depress or recruit the SNS in response to environmental demands, the brake allows for immediate engagement and disengagement with others during social interaction. In numerous studies with infants and young children, studies show that vagal tone is an important indicator of self-regulation, sustained attention, resiliency and the ability to calm down after experiencing a stressor. This capacity to regulate behavior is a critically important function in relationships. Those who are able to think and act flexibly, maintain attentional control, and regulate emotions and behaviors are far more able to respond appropriately to interpersonal stressors and demands than those who lack these competencies. 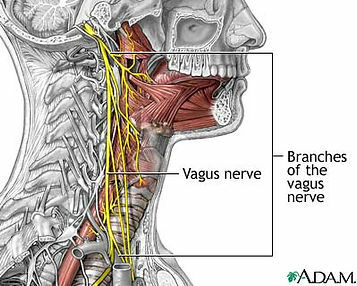 The vagus nerve is bi-directionally influenced, both sending and receiving signals between the brain and visceral organs. When the body experiences physical or psychological stress, the vagus is recruited in the initiation of a compensatory behavioral response by either applying or releasing the vagal brake. But when real or perceived stress is chronic, homeostatic balance is difficult if not impossible. The SNS becomes consistently dominant and the vagal brake is less frequently applied. 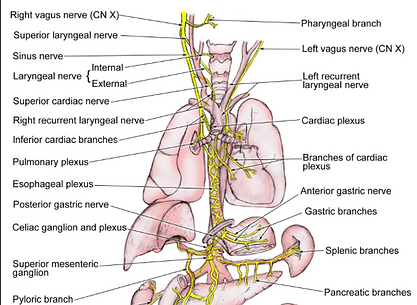 The vagus nerve controls muscles associated with speaking, swallowing, sucking and, most importantly, breathing. It is inherently linked to social behavior through its activation of the muscles of the face and neck including those that influence facial expression and vocal resonance. Higher states of vagal tone and the capacity to effectively use the vagal brake are linked to greater emotional stability, cognitive flexibility, behavioral regulation, prosody of speech, and appropriate facial expression – all key capacities of socially skilled behavior. Conversely, poor vagal brake regulation is linked to dysfunctional behavior. In addition to its impact on facial muscles, the vagus both controls, and is influenced by respiration. When the vagal brake is activated and the PNS system is recruited, heart and respiration rates lower, and the system returns to a homeostatic state, which is usually experienced as relaxation. Conversely, when the brake is lifted and the SNS dominates, respiration and heart rate become rapid, and survival-oriented behaviors related to the fight or flight response become foremost. Because the vagal tone both influences and is impacted by respiration, we can increase vagal tone through manipulation of the breath. As you will recall, vagal tone increases during exhalation. By slowing down our respiration through deep, intentional breathing and elongating our exhalation, we can activate the vagal brake and elicit the relaxation response almost immediately. Once this response is initiated and PNS is dominant, our brains cease to be governed by the limbic system and fear circuitry that limits our capacity to effectively think, plan, reason and respond to others. This means that we are no longer subject to a narrow range of defensive or escape behaviors. Through intentionally deepening the breath and prolonging exhalation, we access not only the relaxation response, but also the capacity to be mindfully present in relationship. With time and practice, intentional breathing can be used as a powerful tool to diffuse stress and manage difficult or conflictual interpersonal circumstances. Through changing the body via the breath we have the capacity to not only change our mindset, but also our relationship to others. 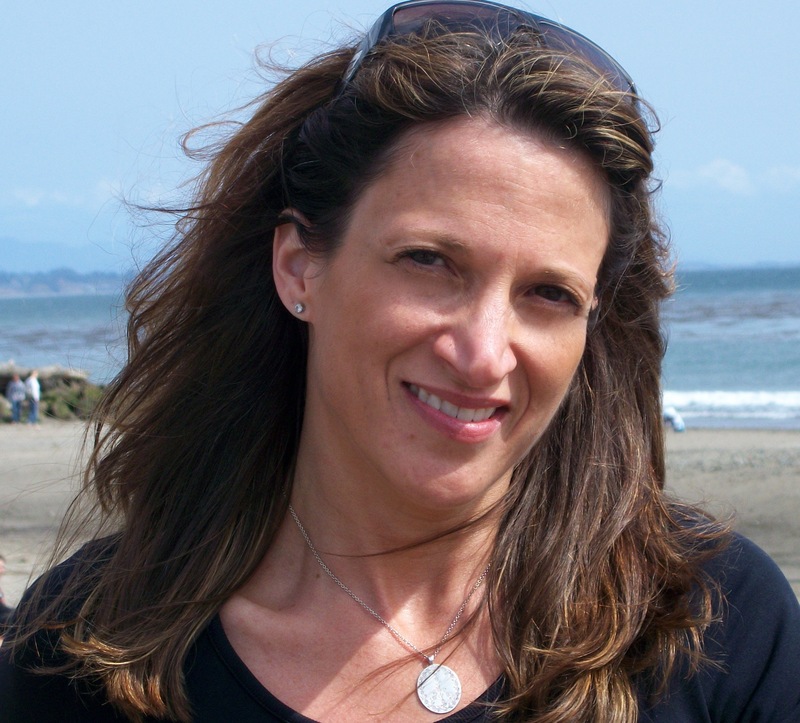 B Grace Bullock, PhD, E-RYT 500 is a psychologist, research scientist, educator, author, yoga and mindfulness expert and creator of BREATHE: 7 Skills for Mindful Relationships. Her mission is to reduce stress, increase health and wellbeing and improve the quality of relationships. She offers classes, workshops, writing and research that combine the wisdom of applied neuroscience, psychophysiology, psychology and contemplative science and practice. Her goal is to empower individuals, groups, leaders and organizations to reduce chronic stress and increase awareness, attention, compassion, mindfulness and effective communication to strengthen relationships, release dysfunctional patterns and unlock new and healthy ways of being. Dr. Bullock is a Certified Viniyoga Therapist and Faculty at the Integrated Health Yoga Therapy (IHYT) Training program. She is the former Senior Research Scientist at the Mind & Life Institute and former Editor-in-Chief of the International Journal of Yoga Therapy. For more information see www.bgracebullock.com. Originally published at bgracebullock.com, reprinted with permission. Myelin refers to a white, fatty substance that surrounds the axon of certain nerve cells. This layer, the myelin sheath, electrically insulates nerve fibers from other electrically charged molecules, increasing their rate of signal trautonomic nervous system mission when compared to unmyelinated nerves.